The English and Cultural Studies (ECS) faculty have transformed a traditional classroom into a Creative Arts Studio. This room houses classes in drawing, design fundamentals, collage, book-making, environmental art, and a host of other studio-based subjects. 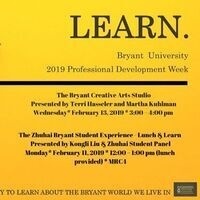 Learn about the Creative Arts Studio and how this space uses "making" practices to enhance learning.